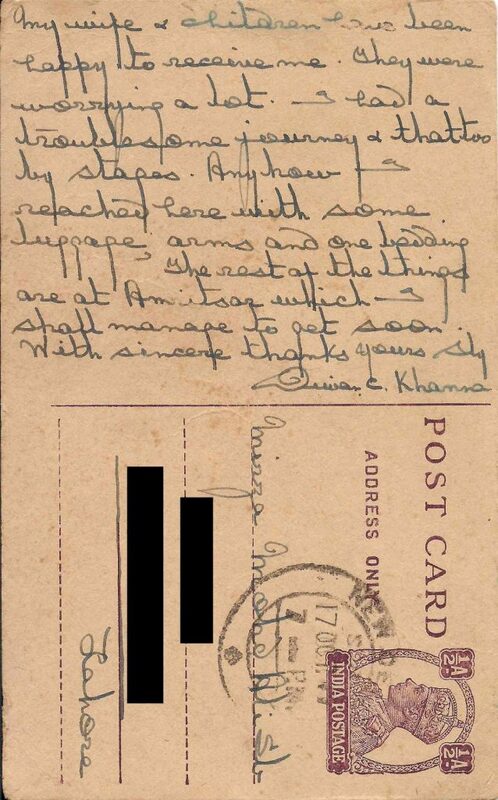 In a recent trip to our family home, my mom rediscovered an old postcard addressed to my great-grandfather, Mohammad Ali Mirza. 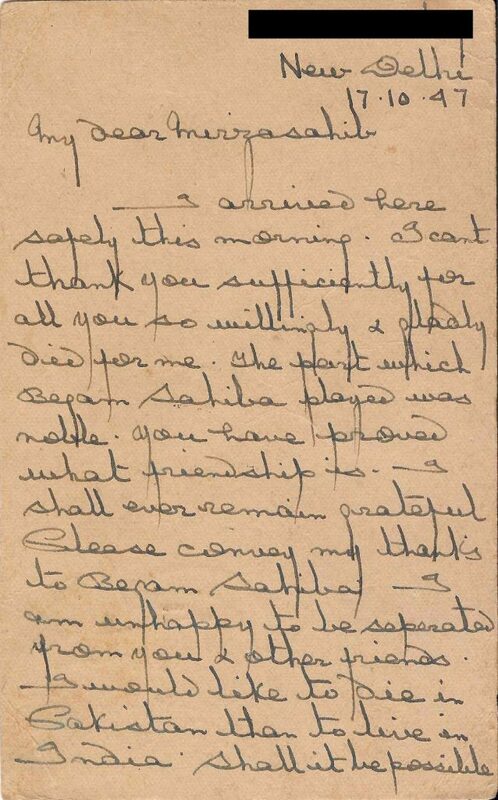 The letter was sent to him on October 17, 1947 in the aftermath of the partition of British India by his Hindu friend Diwan C. Khanna, who had to flee from Lahore to Delhi. It is a really interesting primary source that gives insight into the pain and grief that those who had to leave their lives and homes behind felt at the time. I’ve written a longer article analyzing the letter and what I think it means for Indians and Pakistanis today, which can be read both in the Indian publication The Quint and in the Pakistani publication The Express Tribune. I arrived here safely this morning. I can’t thank you sufficiently for all you so willingly & gladly did for me. The part which Begum Sahiba played was noble. You have proved what friendship is. I shall ever remain grateful. Please convey my thanks to Begum Sahiba. I am unhappy to be separated from you & other friends. I would like to die in Pakistan than to live in India shall it be possible. My wife & children have been happy to receive me. They were worrying a lot. I had a troublesome journey & that too by stages. Anyhow I reached here with some luggage, arms and one bedding. The rest of the things are at Amritsar which I shall manage to get soon. Recently, I watched the movie Arrival (released in 2016) and was impressed by its philosophical profundity and intellectual portrayal of first contact with aliens. The movie keeps you in suspense throughout and makes you think deeply even long after it’s over. As someone interested in languages, I appreciated the substantial time it gave to just solving the linguistic problem of communicating with extraterrestrials in the first place. 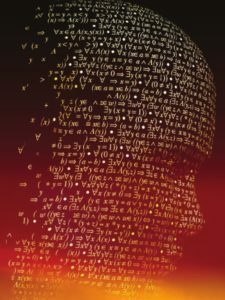 It made perfect sense when I discovered, while reading more about the movie, that it was based off a short story by a prominent science fiction writer, Ted Chiang. Since Arrival had such unique plot elements and involved many scientific and linguistic details, it was clearly the work of a serious and thoughtful author. I then decided to read “Story of Your Life”, which served as the basis for Arrival, and the other short stories included in Chiang’s collection, titled Stories of Your Life and Others (published in 2002). Set everywhere from ancient Mesopotamia to the rapidly approaching future, these short stories represent his first eight works, and they were refreshing to read. A few of the stories, like “Hell is the Absence of God”, take place in fantastical alternate universes, whereas others like “Division by Zero” and “Liking What You See” feel much closer to home. With his sharp prose and interesting utilization of scientific, philosophical, and theological concepts, Chiang definitely succeeds in crafting thought-provoking stories with original plots. An important feature of this collection is the variation of narrative styles that Chiang employs: he includes second-person flashbacks in “Story of Your Life”, presents “The Evolution of Human Science” as an article from an academic journal, and portrays “Liking What You See” as a documentary with snippets from characters’ speeches and interviews. The fact that Chiang is so precise not only in his language, but in his presentation of that language, really indicates his skill as a writer. Plus, the way he builds up each story’s setting and characters really immerses the reader in that world, making you invested in the plot and its protagonist(s). I read “Story of Your Life” first and really enjoyed the way he structured it by interrupting the story multiple times with flashbacks and eventually coming around full circle to explain everything. It is definitely an optimistic portrayal of what humanity’s first contact with aliens might be like if they landed on Earth, but the fact that the aliens are so different from any terrestrial organisms and the way humans try to communicate with them feel realistic. As in the movie, the ending is logically mind-boggling and emotionally heavy. Throughout the 50 or so pages that it fills, this story engages the reader’s mind by diving deeply into everything from the physics of refraction to the semiotics of writing. At a philosophical level, it deals with issues of life, death, and free will in a way that keeps you pondering for days. Some details in “Story of Your Life” were surprisingly and importantly different from Arrival, especially the circumstances of the daughter’s death, but I was still able to appreciate the movie’s adjustments after reading the original story. Each of the other stories in the collection is also unique in terms of storyline and rich with meaning. My two other favorites would probably be “Tower of Babylon” and “Liking What You See”, primarily because of their intriguing premises. On the other hand, the least captivating stories in my opinion were “Seventy-Two Letters” and “Division by Zero”. This might be because they felt a little too dry and technical in building up their plots. In between, “Understand”, “The Evolution of Human Science”, and “Hell is the Absence of God” were all interesting short stories that are worth reading. “Tower of Babylon” is, as the title suggests, based on the biblical story of the Tower of Babel, although it doesn’t involve the “confusion of tongues”, which I thought it might have given the author’s interest in linguistics. In this version of the story, the Babylonians have spent several decades building a massive tower in order to break through the heavens and be face-to-face with God, and in the process the tower has amassed its own population. I liked this story because of the attention it pays to the logistics of building and living on such a structure in an ancient setting without modern technology, as well as the societal effects it has on the people. The surprise ending is reminiscent of that of “Story of Your Life”, but perhaps not as mind-bending or interesting as it could have been. The last story, “Liking What You See”, is presented as the transcript of a documentary, with snippets from speeches and interviews revolving around a social justice debate on a college campus. Essentially, the student body is debating whether or not to mandate (for all students) a new procedure that prevents the brain from being able to distinguish beautiful faces from unattractive ones, in order to prevent the discrimination of “lookism”. The premise is strikingly similar to real-life debates taking place these days on American campuses, and perhaps if the sort of technology Chiang made up in the story is actually possible, we will be facing such a situation in the near future. Individuals from both sides of the debate make captivating arguments one after the other, highlighting the complexity of ethical issues and the tension between freedom and equality. In the end, I’m glad that Arrival introduced me to Ted Chiang’s excellent work, and I’m sure that more of his stories could be successfully adapted on screen. Reading Stories of Your Life and Others has definitely rekindled my interest in reading fiction, especially science fiction, and I highly recommend it. Personally, I look forward to reading Chiang’s “The Merchant and the Alchemist’s Gate” (published in 2007) soon. In no particular order, here is my list of the top five versions of the qawwali “Tajdar-e-Haram”. You can find my full translation of the poetry here. The original by the Sabri Brothers is obviously very hard to match, but I think others have also done justice to it. Post any more versions of “Tajdar-e-Haram” that you enjoy in the comments! Highlights: The original is always the original, and here the Sabri Brothers are at their best. The two brothers’ voices are very distinct and complementary. They show their musical mastery in this qawwali by repeatedly varying the pace and volume, taking listeners on a journey. Highlights: Amjad Sabri ventures out of traditional qawwali in this soulful collaboration with Shahi Hasan. It’s an amazing composition in its own right, with lots of overlapping vocal tracks, and the female background vocals at the beginning are really mesmerizing. Highlights: Atif’s Coke Studio version is also not traditional qawwali, but it includes a wider array of instruments that enhance the song. At times, the emotion in his unique voice really comes through. Highlights: This is a really cool (and rare) rendition by two of Bollywood’s most famous singers, Sonu Nigam and Sukhwinder Singh. While not focusing on the raw and spontaneous nature of traditional qawwali, this version lets their amazing, highly-trained voices shine. Highlights: Fareed Ayaz & Abu Muhammad paid tribute to the Sabri Brothers and Amjad Sabri through a more traditional performance. This version is loud and powerful, with excellent percussion (check out the vocals at 0:49 and the change in beat at 17:58). “Balaghal-Ula Bi-Kamalihi” is a popular qawwali most famously performed by the late Sabri Brothers, Ghulam Farid Sabri (1930-1994) and Maqbool Ahmed Sabri (1945-2011), from Pakistan. It is a multilingual naat (praise of the prophet Muhammad) that centers around a famous Arabic quatrain (rubai) by the Persian poet Saadi Shirazi (1210-1292). The four-line poem is dispersed between several verses of Urdu and Persian poetry from sources that I have been unable to identify. If anyone recognizes any of the poets whose verses show up in this qawwali, your contribution would be appreciated. Any corrections or improvements would also be appreciated. The main poem is: “Balaghal-ula bi-kamaalihi / Kashafad-duja bi-jamaalihi / Hasunat jameeu khisaalihi / Sallu alaihi wa aalihi”. (This is in Arabic, but in the translation I do not repeatedly identify it as such because of how spread out it is.) Much of the rest of the qawwali focuses on the story of the “miraj” (“ascension”), an event in Muhammad’s lifetime during which he is said to have ascended to heaven and beyond (to the Placeless Origin to visit the throne of God) on a winged creature named Buraq. The entire trip is said to have occurred in one night. According to some scholars of literature, this story partially inspired the Italian poet Dante’s epic poem, The Divine Comedy. In the Urdu verses of this qawwali, we see how the monumental meeting between God and Muhammad is metaphorically framed as a meeting between lovers. For example, God summons Muhammad because “He longed to see him”. This metaphor is used to elucidate the common Sufi themes of separation and union, in which the separation of every being from God is a burden, whereas the ultimate goal is union and becoming one with God. He longed to see him – the ‘ascension’ was just an excuse! Is there any limit to his ascent? What can I say about his perfection! What brightness his beauty has created! I am amazed by his characteristics! Our hearts and lives are occupied by thoughts of him! Scholars have sometimes criticized the Urdu ghazal for being atomistic, i.e. being composed of several unrelated couplets. I think “Dil Mein Ik Leher” is a strong example to the contrary. The first two verses indicate that some kind of positive change is taking place, although we are not sure what. The third couplet hints that something has been missing (or someone, as we find out). In the next two couplets, it appears that the fresh change is that memories of the poet’s beloved are coming back to him – or perhaps she herself is on her way. In the next three couplets, the poet has sprung to take action himself, searching through the city, looking for open opportunities, and calling his friends to rise up as well. Finally, the last verse leaves us with optimism for what the future holds. Metaphorically, the central message of the poem could be seen as to stay optimistic and take action to pursue your goals, even though they may seem distant. This ghazal has famously been sung by two Pakistan artists, Ghulam Ali (1940-present) and Tassawar Khanum (1950-present). Pay close attention to the many different ways in which Ghulam Ali sings the word “leher”. By fluctuating the tone, pitch, and length of the word, he evokes the image of different kinds of waves in the ocean. So what if you are not joining me in conversation? Your voice is reaching me right now? Good times, too, will come O Nasir! Don’t grieve, your whole life is ahead of you right now! But it’s also partly that this wound is fresh right now! This Urdu ghazal was penned by the Pakistani poet Fana Buland Shehri and performed as a qawwali by the great Ustad Nusrat Fateh Ali Khan (1948-1997). I could not find much online about the poet’s life, but quite a few famous qawwalis are attributed to him. Although “Mere Rashk-e-Qamar” is not as famous as other qawwalis performed by Nusrat Fateh Ali Khan, in my opinion it is one of the most poetic and powerful ones. * Note on the takhallus: The takhallus (Urdu: تخلص) is the pen name adopted by a poet in Urdu, and is usually incorporated into his/her poems near the end. It often has a double meaning as both a name and as a word. Fana Buland Shehri included his takhallus in this qawwali when he says, “ae Fana shukar hai aaj baad-e-fana, us ne rakhli mere pyaar ki aabroo”. Fana is the author’s name, but it also means “annihilation”. This adds another meaning to that line: “O annihilation (death), today I am grateful that after my demise, she has maintained the honor of my love”. Sufi devotional music has long and rich history in South Asia. One of its major forms is qawwali (Urdu: قوالی), which originated at the shrines of Sufi saints centuries ago. The content of qawwalis is either religious or romantic poetry (or both, as per the Sufi influence). Those who sing qawwali are known as qawwals. A party of qawwals includes a lead singer (or two), accompanied by side singers, clappers, a harmonium or two, and tabla and dholak drums. Qawwali songs are traditionally very long, as they involve a lot of repetition of lyrics. They often begin slowly and increase in energy gradually. The singing of notes instead of words, sargam (Urdu: سرگم), is usually intertwined with the lyrics of the composition. Overall, qawwali is a mystical and hypnotic kind of music that can be spiritually awakening. It appeals to many people, and one need not be religious to appreciate it. “Bhar Do Jholi” is a popular qawwali most famously performed by the late Sabri Brothers, Ghulam Farid Sabri (1930-1994) and Maqbool Ahmed Sabri (1945-2011), from Pakistan. It was written by Purnam Allahabadi and is mainly a praise of the Prophet Muhammad (naat), though also of his companion Bilal and his grandson Hussein. Purnam Allahabadi (-2009) was the pen name of Mohammed Musa, a prolific Urdu poet, although the performers of his work have gained more fame than he has for it. “Bhar Do Jholi” was published in his book Phool Dekhe Na Gaye (I Could Not Look at Flowers), which you can read online here on Rekhta (it starts on page 21). The poet/singer of this qawwali takes on the role of a beggar, coming to ask the Prophet Muhammad for food and/or money. Yet, this is only the surface meaning; he is not only begging for physical sustenance but for spiritual sustenance and redemption as well. I have translated the title phrase “bhar do jholi” as “fill my bag”, but that does not convey the meaning totally accurately. Here, “bag” refers to the lower portion of one’s upper garment that beggars fold upward from the bottom corners and hold to fill it with change. So, the narrator of the song is extending his garment out in front of Muhammad to metaphorically have it filled. He also sings in praise of the grandson of Muhammad, Hussein, who was martyred by the tyrant Yazid at the Battle of Karbala. Near the end, he praises Bilal, an Ethiopian slave who was freed by Muhammad’s friend, Abu Bakr, and was chosen by Muhammad to recite the adhan, which is the Islamic call to prayer. What does the world not receive at your doorstep? The times are against me, where should I go? To whom should I show my state of helplessness? In front of whom else shall I spread my hands? How great is the rank of Hazrat Shabbir! At that hour, the age will call out, “O you who are afflicted and suffering! Fear not, sinners! Fear not, sinners! “O Mustafa, Bilal recites the adhan incorrectly. Mustafa declared, “Let us see if this is true. And asked Mustafa, “O King of the Prophets! Which adhan was it but the adhan of Bilal? * Note on names: Mustafa is another name for Muhammad, and Murtaza is another name for Ali, Muhammad’s son-in-law. The son of Murtaza mentioned, also Muhammad’s grandson, is Hussein. Shabbir is another name for Hussein. Hazrat is an Islamic honorific title used for prophets, saints, and other important religious figures. * Note on the takhallus: The takhallus (Urdu: تخلص) is the pen name adopted by a poet in Urdu, and is usually incorporated into his/her poems near the end. It often has a double meaning as both a name and as a word. Purnam Allahabadi included his takhallus in this qawwali when he says, “kaash Purnam dayaar-e-nabi mein jeete ji ho bulaawa kisi din”. Purnam is the author’s name, but it also means “tearfully” or “weeping”. This adds another meaning to that line: “If only I may be summoned to the land of the Prophet someday in my life, weeping [from being overwhelmed]”.